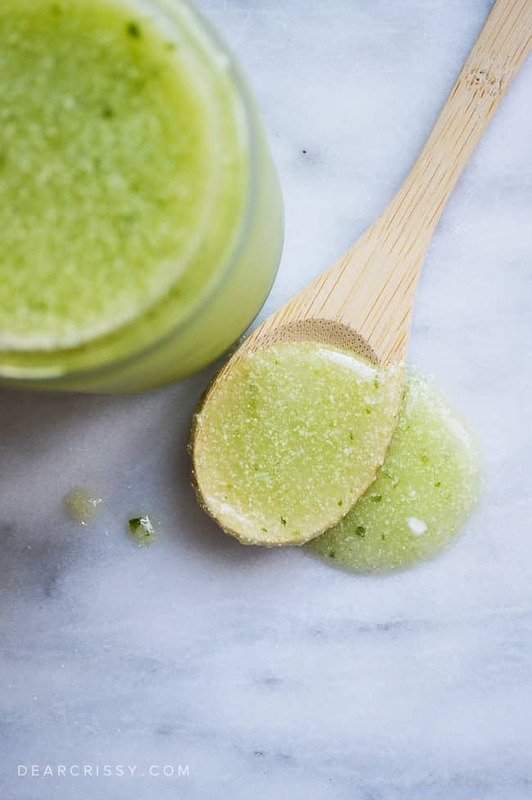 I love finding new ways to exfoliate and hydrate my skin, and this DIY cucumber body scrub not only makes my skin super-soft, the smell is also intoxicating! 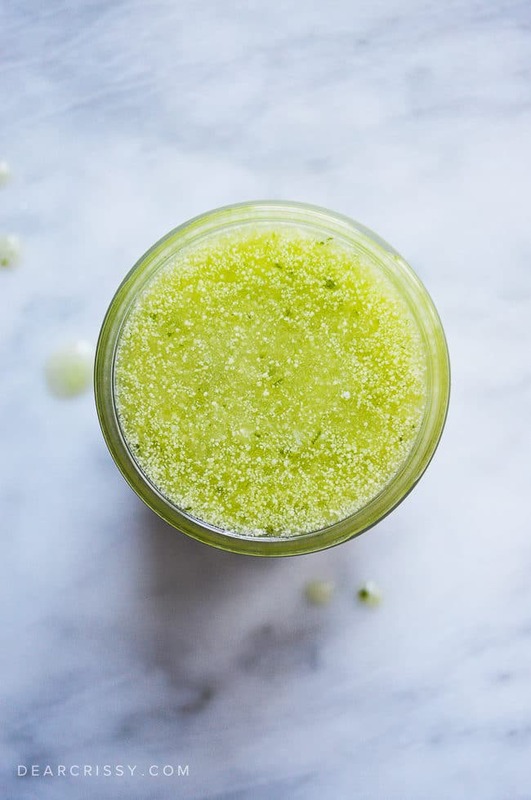 The best news is, you can blend this easy cucumber body scrub at home using just a few simple but nourishing ingredients. 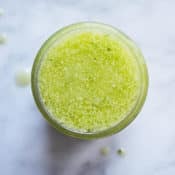 This cucumber body scrub recipe offers a super way to have a refreshing scrub without harsh chemicals or bold scents overwhelming you. 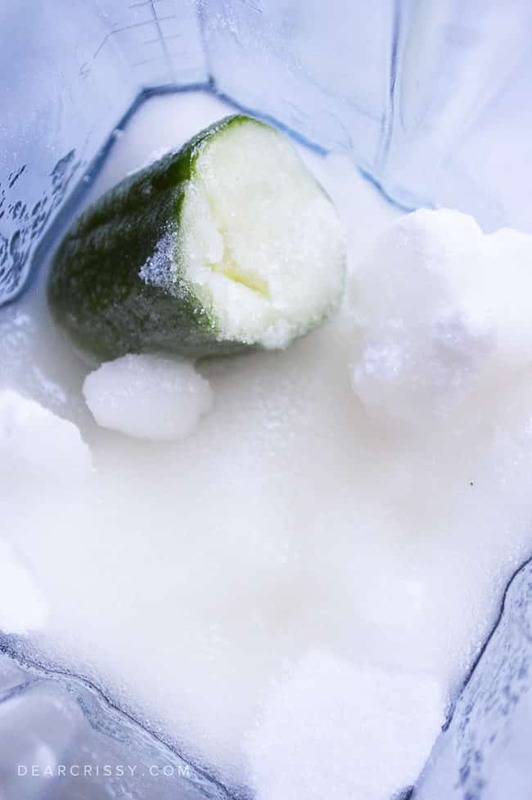 A cucumber scrub is light and smooth while still cooling and energizing. 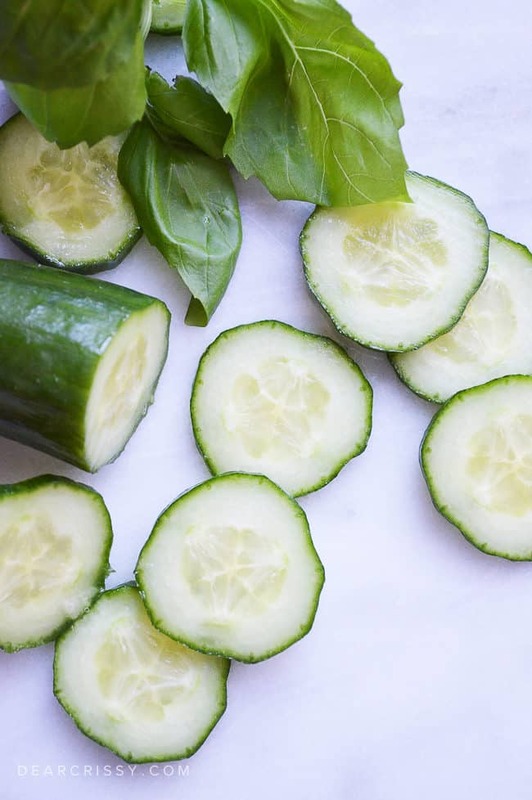 The freshness in the cucumber and optional basil will awaken your skin, while the sugar gently buffs off old skin cells and reveals healthy new layer of skin. The cherry on top is the moisturizing coconut oil that will absorb into your skin leaving it silky smooth. This cucumber body scrub is a fantastic morning shower choice thanks to it’s light and refreshing scent! Use as the last thing you do in the slower and simply rinse off, then pat dry (instead of rubbing), this will help keep the coconut oil on your skin and moisturize all day long, giving your arms and legs a gorgeous, healthy glow. I really love cucumbers in beauty products. I’m partial to the fantastic scent, but cucumber is also full of antioxidants, reduces inflammation and ultra-hydrating. 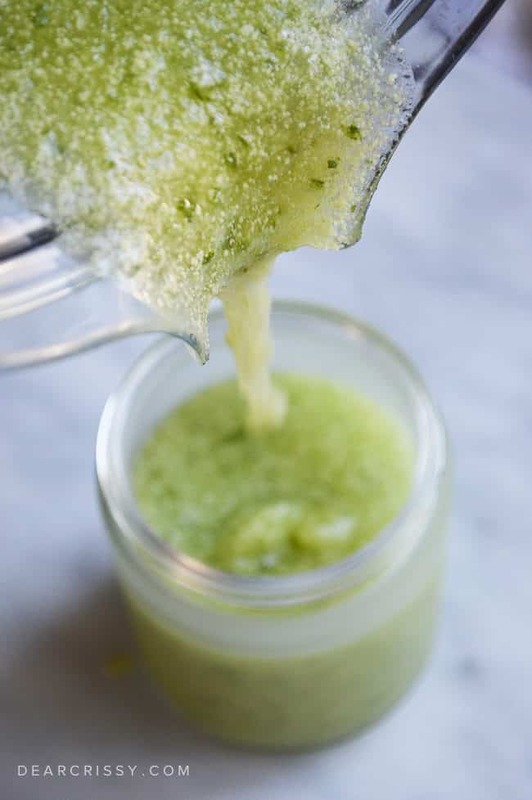 This cucumber body scrub takes very little effort to whip-up, and it’s a great way to pamper your skin. I love using it to scrub the rough skin on my knees and elbows and find that my skin looks and feels plumper after I’ve used it. 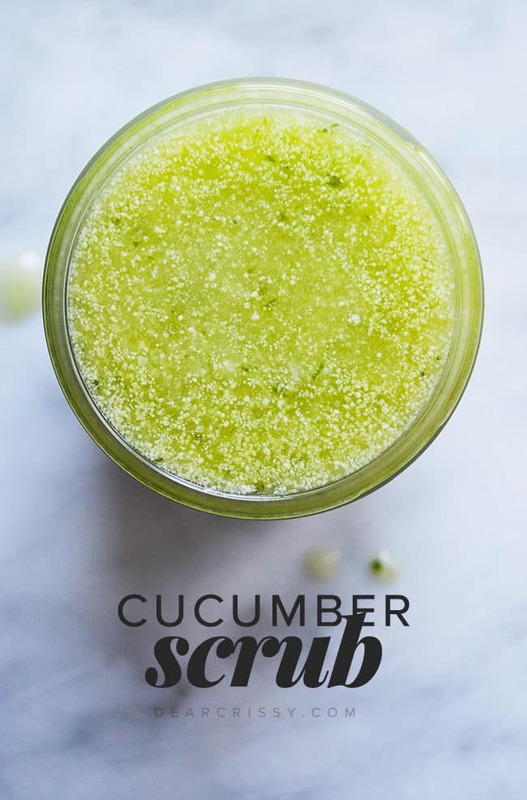 Grab the recipe and instructions for this great DIY cucumber body scrub below and be sure to let me know how you like it if you give it a try! Wash the cucumber and basil and pat dry then toss in the blender, you can pre-chop or slice before blending. 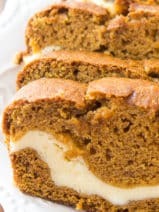 Pour the sugar on top and then add in soft or liquid coconut oil. Whip until the cucumbers have broken down and you’re happy with the consistency; this took about 45 seconds to a minute in our blender. If the cucumber is chilled or cold when it goes in the blender then it may cause the coconut oil to solidify, this happened with mine and wasn’t a problem at all, yours might just look a pinch different from what is shown if the ingredients you use are all room temperature. Pour into a jar that can be sealed and store in the refrigerator until ready to use. This should keep nicely for up to two weeks. 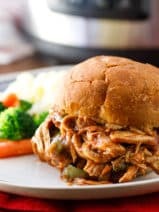 Simply plan to take it out of the fridge a little bit before you will use it or you can scoop some out and put it into a shower or bath safe dish when ready to use. If giving this as a gift, be sure to remind friends that they’ll need to keep it chilled and an eye on the shelf life because of the fresh ingredients. *Just make sure to take extra care when using oils (like the coconut oil in this) in the bath or shower as they can make surfaces and floors slippery. This sounds amazing. 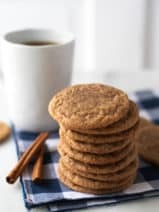 Thank you for the recipe share. I will give it a try. Are there any substitutions for coconut oil? I’m allergic. Use your scrub on wet skin. The sugar helps exfoliate and dissolves down the drain. The oil actually stays on your skin! No slippery tub/shower so it’s not going down the drain! I love cucumber body products and the added basil PLUS coconut oil? I’m in heaven! 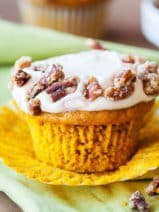 Can’t wait to try and make this next weekend! I cannot wait to try this!!! I am a lover of all things cucumber and need a little at-home spa treatment after having my fourth child just five weeks ago!! Thanks!